Just have a look at this concise yellow bag that is effortlessly stylish! It straddles the line between minimalist chic and downright simplicity. The bag is made with a great eye for detail features: a small magnetic lock, a removable strap, neat stitching, etc. Such unpretentious, abstract-like style radiates a sense of timeless elegance! So, if you are looking for a more sophisticated bag, this one is for you. Has three compartments and a removable strap to turn your clutch into a shoulder bag. This item is ONLY obtained through Amazon and the seller "RedCube LLC". Dry dirt such as dust or powder should be removed with a cotton or micro-fiber cloth. Washing-up agents, liquid soap, solvent based on kerosene are not recommended. Care products for genuine leather should not be used for eco-leather. Protect your bag against hot objects and alcohol consumption. That may cause irreversible changes to the structure, color and features of the eco-leather. Avoid the contact with fabrics which colors may run (e.g. blankets or cushions in intense colors), as it may cause a permanent coloring. We are proud to offer you an outstanding variety of clutches and bags. Great care is taken to ensure that every item is as strong and high-quality as possible. All items can be exchanged. We can also provide a 100% money-back guarantee in case you are dissatisfied with your clutch. Feel free to contact us! We are happy to provide you answers to any questions you have! A great clutch with an adjustable strap is characterized by strict lines and absence of superfluous details. The brilliantly simple, almost unisex design would demonstrate that you have an intimate understanding of the malleability of style. And the color of the bag is a hearty reminder that winter looks needn't be drab, depressing or monotone! This amazing bag best expresses street style. 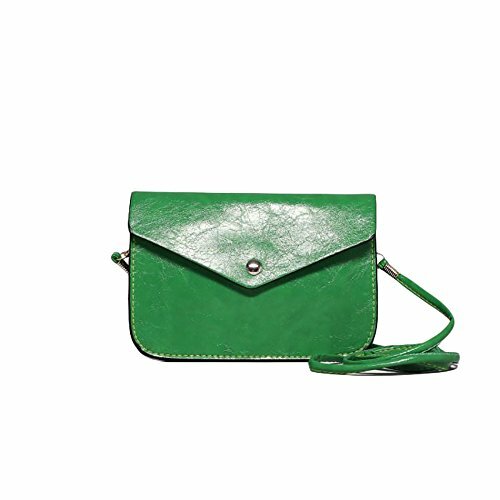 You can wear this piece crossbody which is particularly suitable for the city. It is also a sophisticated accessory to be paired with a Friday-night drinks outfit. You can't get enough of this statement bag that you could carry forever! Made of top quality eco-leather which is produced with a minimal environmental impact and mimics the texture and conditions of genuine leather. The dark fabric lining is easy to wash.
Dimensions: Length - 7.1" , Width - 0.6", Height - 5.1". RedCube is a registered trademark. This item is ONLY fulfilled by Amazon and seller "RedCube LLC". We are confident in the quality and safety of our products and are pleased to offer a lifetime guarantee with our items. If you're displeased with what you received, we will change that or give you a full refund. We look forward to serving you in the future. If you have any questions about this product by RedCube, contact us by completing and submitting the form below. If you are looking for a specif part number, please include it with your message.